This birthday card was made for one of my daughters. Though she is not a child any more, she still appreciates receiving whimsical, fun cards from her Mom. Love that bit of child that is still in her! Love these Tiny Heroes stamp set from Mama Elephant. The images are so cute and perfect to color. I used my Copic markers to color the super hero and the curved skyline. Though I used a skyline stamp from an old obsolete Studio Calico stamp set, I think you could use any of the more current skyline stamps to create a similar look. The female hero was stamped, colored and then die-cut using the coordinating die set for the Tiny Heroes stamps and then mounted using foam tape to add a bit of dimension. I used primary colors of red, blue, yellow and green to convey the look and feel of a comic book character. I created the sentiment for this card from a couple of stamp sets. The “Super Duper” was from the Tiny Heroes stamp set. 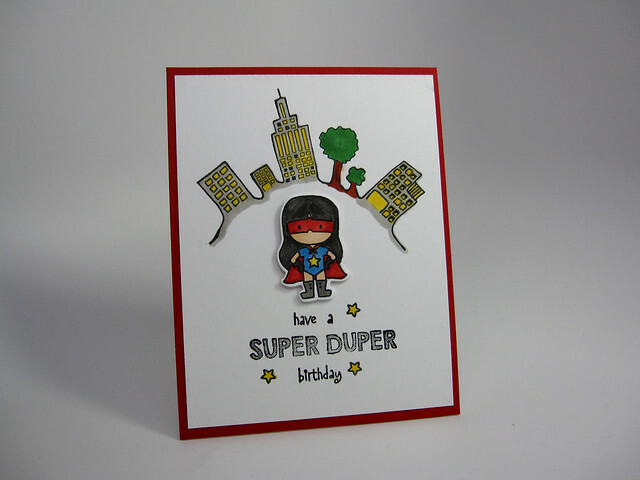 I inked the” Super Duper” separately, masking off all the other words from the sentiment using painters tape before inking and then removing the tape before stamping onto the cardstock. I then used the individual words “have”, “a” and “birthday” from an Impression Obsession clear stamp word set called Sentiments I. I placed these words on small acrylic blocks and stamped them separately. I love this stamp set for two reasons. Firstly, the individual words are in a nice font, and secondly, there are lots of different words. These two reasons make it so versatile that you can create your own sentiment or alter a sentiment from another stamp set, like I did here to make a completely new sentiment. Impression Obsessions has another word set, Sentiments II the words in that set are all in caps, in a block font and focus more on holidays and occasions. It’s a great set to have as well. I love it when I can use some basic stamp sets to help me stretch my stamps. Stamps: Mama Elephant: Tiny Heroes stamp set; Studio Calico: curved skyline (don’t know the name; the stamp set is from an old monthly card kit). Inks: Memento Ink in Tuxedo Black, Versafine Ink in Onyx Black for the sentiments. Dies: Mama Elephant: Tiny Heroes Creative Cuts (the coordinating die set to the Tiny Heroes stamps set). Cardstock: Neenah Solar White 110# for card base; Neenah Solar White 80#; Stampin’ Up: Real Red cardstock for mat. Other: Copic markers, 3-M foam tape. This entry was posted in Birthday, Occasions and tagged Impression Obsession, Mama Elephant, Studio Calico. Bookmark the permalink.